The story of Anne Frank and her family is well-known through the diary bearing her name. This tragic tale is frequently used to counter Holocaust revisionists. The details of the story are often forgotten or replaced with assumptions regarding the fates of Anne Frank and her family. The facts of the story actually support the revisionist view of the Holocaust. The teaching of The Diary of Anne Frank should be embraced by Holocaust revisionists and all who care about learning the truth of what really happened to Europe’s Jews during the Second World War. The popular media version of the Holocaust would have us think that almost all would be gassed upon arrival at the “death camps” and especially Auschwitz. While perhaps a few very strong Jews might be utilized for manual labor, all children, the elderly, the sick would surely be murdered as part of a program of extermination. However tragic the story of Anne Frank and her family is, its narrative states that Anne Frank was not gassed at Auschwitz. In fact, after being transported to Auschwitz, she was later transported back west to Bergen-Belsen where she succumbed to disease —typhus, the very disease that Zyklon-B (the alleged killing agent) was used in the camps to combat. The story of Anne Frank is a typical example of the fate of many Jews during this time. What follows is an unpublished letter from David Merlin of the Committee for Open Debate on the Holocaust. Merlin submitted this letter to the New York Times in November 2013. The New York Times did not think it was fit to print. As Merlin suggests, understanding the details of the fate of Anne Frank and her family would help to reveal the truth of the policies of the German government during the Second World War. Merlin writes, “details allow us to learn what really happened.” Those details may be inconvenient to some, but due attention to them can greatly aid in dispelling the shroud of calumny and victimhood that today distorts our understanding. While Anne Frank’s story is tragic, you ignore the manner of death of the 8 people in the Annex. The official history is that non-working Jewish people arriving at Auschwitz were all “gassed.” But of the eight sent to Auschwitz on September 3, 1944 from the Annex, not one of them was killed in a gas chamber. Instead, five of the eight were transported back to Germany-Austria in November 1944. The Frank Family was detained for failing to report for labor service and for going into hiding. 1. Anne Frank– sent to Auschwitz, then transported to Belsen where she died of typhus (in Belsen not Auschwitz). 2. Otto Frank– left behind in Auschwitz with those in the sick barracks. Survived the War. 3. Edith Frank-Holländer–left behind in Auschwitz as the Germans retreated. 4. 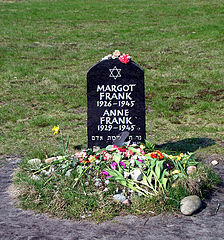 Margot Frank (Anne’s older sister) died of typhus in Belsen (not Auschwitz). 6. Auguste van Pels born Auguste Röttgen (Hermann’s wife), whose date of death is unknown. Witnesses testified that she was with the Frank sisters during part of their time in Bergen-Belsen. According to German records, van Pels was sent to Bergen-Belsen concentration camp in Germany with a group of eight women on November 26, 1944. Hannah Goslar’s testimony was that she spoke to van Pels through the barbed wire fence “in late January or early February”. Auguste was transferred on February 6, 1945 to Raguhn (Buchenwald in Germany), then to the Czechoslovakia camp Theresienstadt ghetto on April 9, 1945. 7. Peter van Pels died in Mauthausen (not Auschwitz). 8. Hermann van Pels died in Auschwitz. It is often claimed that he was “gassed.” However, according to eyewitness testimony, this did not happen on the day of his arrival there. Sal de Liema, an inmate at Auschwitz who knew both Otto Frank and Hermann van Pels, said that after two or three days in the camp, van Pels mentally “gave up.” He later injured his thumb on a work detail, and requested to be sent to the sick barracks. There is no evidence whatever for the assertion that Hermann van Pels was gassed. The pattern is the same with other groups closely associated with Anne Frank who were also sent to Auschwitz from Holland. 9. Eva Geiringer — born May 11, 1929. Sent to Auschwitz May 1944 Step-sister of Anne Frank. Survived the War. 10. “Fritzy” Geiringer, mother of Eva, Married Otto Frank. Survived the War. 11. Heinz Geiringer, brother. Survived Auschwitz but died on a forced march out of the camp. 12. “Pappy” Geiringer. Survived Auschwitz but died on a forced march out of the camp. The Geiringers were immigrants from Austria; They too ignored a call up for labor service received July 6, 1942 and went into hiding. They were found out on May 11, 1944, detained and were sent to Auschwitz that month. 13. Janny Brandes-Brilleslijper. Was arrested for forgery. Was in the Westerbork, Auschwitz and Bergen-Belsen concentration camps. 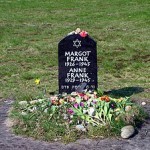 Traveled to Auschwitz on the same train as the Frank family and to Belsen with Anne and Anne’s older sister Margot. Survived the War. 14. Lientje, sister of Janny. Was in the Westerbork, Auschwitz and Bergen-Belsen concentration camps with Janny. Survived the War. Elsewhere you have praised the “relentless pursuit of historical details.” You are right. Details allow us to learn what really happened. In this case the details tell us that none of the people traveling with Anne Frank died in “gas chambers.” Why? And why did the Germans transport Anne, her sister, Janny, Lientje and so many others back into Germany in 1944? These are details which should profoundly affect our, and your, understanding of German policies.